All reviews and site design © by Thomas M. Wagner. SF Reviews.net logo by Charles Hurst. 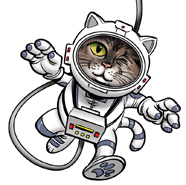 Wink the Astrokitty drawn by Matt Olson. All rights reserved. Book cover artwork is copyrighted by its respective artist and/or publisher. A sumptuous, poetic epic that took its author 13 years to complete, the Gormenghast Trilogy is considered by some to have an equal or even greater degree of importance to the development of modern fantasy as Tolkien's The Lord of the Rings. 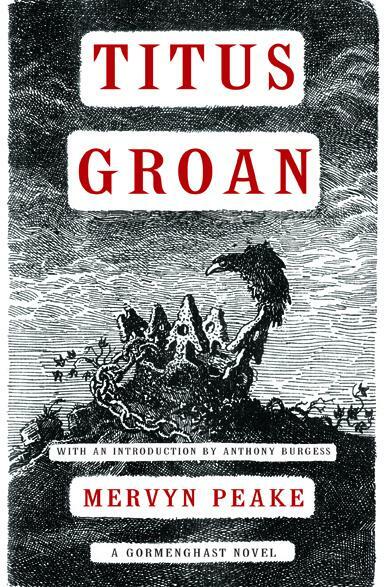 And though Tolkien today has set the formula from which the overwhelming majority of contemporary fantasy writers borrow or steal (hell, no sense in being coy about it), Mervyn Peake earns his position in the high-fantasy pantheon for this prodigious and masterful history of Castle Groan beside craggy Gormenghast Mountain. Perhaps much of the reason that the Gormenghast Trilogy (up until a recent series of reprints and a TV miniseries revived interest in it) has been more obscure to today's fantasy readership than Tolkien is due to its unconventional narrative, its unrelenting darkness. In a genre that repeatedly delivers the message "Good Will Triumph Over Evil," these novels might be considered a grimdark precursor. There is nothing in Titus Groan in the way of a clear-cut hero, no brave Conan, no crafty Frodo out to save the world from the forces of evil, neatly encapsulated in the figure of a dark lord in his dark fortress or some similar cliché. No boilerplate fantasy are present, no magic, no elves or other mythic beasts. Only the mythic setting earns the trilogy the label "fantasy." Virtually all of the players in Titus Groan seem corrupted, drained of life and goodness in some way. Titus Groan can in many ways be seen not merely as nightmarish fable, but as a sinister allegory of our own modern society. Then again, as many critics before me have said, this trilogy works on such a multiplicity of levels, that one could run through dozens of possible interpretations. That is its chief claim to greatness. Tolkien's will always be a seminal work of rousing, swashbuckling escapist adventure, but Peake's is the more real, the more visceral, the more darkly profound epic. If any of the above makes this sound too depressing to even bother with, don't you believe it. Peake delivers his cruelest barbs with a humor comparable to George Bernard Shaw or Oscar Wilde. His prose is a wonder to behold, poetic without being stilted or affected. The premise of Titus Groan concerns the principal characters, their relationships to one another, and their reactions, both individually and as a group, to the birth of Titus, the heir to the throne of Groan and the 77th Earl of Gormenghast. From its opening chapter, futility seems the order of the day, as Peake scathingly attacks the rigidity of an overly soft and conventionalized society as a pointless beast perpetuating its own existence for nothing. The nearly city-sized castle is surrounded by a village of hovels whose inhabitants have no contact with those inside except once a year, during a festival in which brightly painted carvings by the town's feuding craftsmen (the carvings seem the town's only artisanry or industry of any kind) are judged by the castle lord. The winner receives the dubious honor of being allowed to pace the castle walls, and the winning carving itself is shunted off to a room in the castle and never viewed again, except by a little old man who cares for them, who himself never leaves the room and is never seen. Throughout, the theme of real things being forgotten and lost (entire wings of the castle are unused and falling into disrepair, and even some of their inhabitants are never seen) coexists with that of meaningless rituals repeated for their own sake. There is precious little human closeness. Lord Sepulchrave, the reigning lord, and his wife, Gertrude, have no real relationship at all, he being blanketed by a pall of almost unrelieved melancholy (which finally becomes full fledged madness), and she an already delusional and pathetic creature who takes her only solace in the company of birds and a veritable army of white cats. Other characters are just as fragile, just as profoundly alone. Yet out of the castle's darkness three characters do attempt to emerge. Fuschia, the introverted adolescent daughter of Sepulchrave and Gertrude, seeks first to withdraw into a world of her own dreams, poems and fantasies, then finally allows herself to be more open in her resentment of the senseless and interminably old traditions that have squeezed the life out of Gormenghast and Castle Groan. Keda, a young woman from the village brought into the castle as a wet nurse for Titus, finally leaves with a brave declaration entirely out of character with her surroundings: "I must have love." Yet even this desire is not without tragic consequences. But the most memorable player here is Steerpike, a youth who rises from a menial position in the castle to one of greater power and influence through the crassest and most brazen acts of manipulation and deception he can contrive. As Castle Groan becomes mired deeper and deeper in its moribund, rigid, and ineffectual tedium, Steerpike's sinister machinations hit everyone like a shock wave, with devastating consequences. Few fantasy writers have the ability to juggle readers' emotions with the dexterity of Peake. Great fantasy can simply entertain, but great literature is that which not only entertains but explores, reflects, and illuminates our own lives. It's in this regard that the Gormenghast Trilogy takes its place not merely as a masterpiece of the literature of the imagination, but quite plainly as a masterpiece of literature.